Arts One/CAP Exclusive Majors Open House! 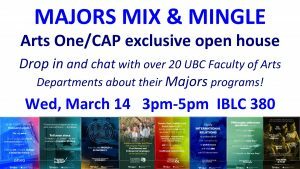 Drop in and chat with over twenty UBC Faculty of Arts Departments about their Major/Minor/Honours options! Stay for five minutes or the whole event!